black flies | Poverty, Agony, Distress & Want! “Why did God make yucky things like black flies and ticks?” asked my four-year son old Noah. “Not sure buddy, there must be a reason” was my reply (the standard answer…I am only a history teacher). Living in northern Ontario, I’ve had to put up with black flies all my life. Most people in Canada and the northern US know what I’m talking about. They are usually most active in the spring, before things start to dry out and get too warm for them. They like to feed particularly on human blood, leaving one with small, red itchy dots at the bite location. Their most annoying trait is the swarming they do around their victim, flying into your hair (I don’t have that problem), up your nose, in your ears, eyes, wherever! Even in your mouth if it’s open…mmmmmm, tasty black fly! Unfortunately they are one of the few things that I hate about where I live. Ticks on the other hand are a completely different story. A few years ago, no one had ever heard of a tick. There were very few of them, if any, around this area. Then things changed. It might have been the movement of more deer into this area, or more likely attributed to global warming. In any case, we now have ticks. Lots of them. My first run in with a tick happened about 5 years ago and every year it gets worse. This year is predicted to be a bad year for them, since the winter and spring were so mild. If the past few days is any indication, the forecasts are correct…I picked so many off the dog I’ve lost count. So this weekend is the Victoria Day long weekend, which I mentioned in last week’s post is the traditional beginning of the summer season here in Canada. In my profession, it also means that summer vacation is right around the corner. And it could not come soon enough! Don’t get me wrong, I love my job, but at this time of the year everyone is a little burnt out and is in need of a refresher. I read somewhere this week (might have been on Twitter) that the old debate of re-vamping the school year is back in the spotlight. For those of you who don’t know, the school calendar was originally designed to accommodate a farming society with the months of July and August off. Yes times have changed, but the need for those two months has not. As I already mentioned, after nine months of school (including several breaks), teachers and students are in need of a disengagement from the stress and routine of the learning environment. Time to re-charge the batteries if you like. That doesn’t mean however that all is forgotten; my gears are always turning about the next year, football, etc. Sometimes I feel like I’m not really on vacation. Weeks before the return I’m already working on things, so I don’t think I ever fully relax. So be it I guess. So the long weekend usually means my first real hike of the season. I had been anticipating this for some time, and I was hoping that the weather would cooperate. My first order of business was to make a trip to my in-laws camp to grab the boat and motor. The camp is located about 65km east of home, and I wasn’t relishing the drive in my old truck. When I bought a new truck last year, I decided to keep the old one for trips into the bush. However, I have become a bit spoiled with the crew cab interior and leather seats! The boys were very excited about the visit to camp; too bad the water is too cold at this time of the year! After our delicious Subway dinner (the boys would rather go to Subway than McD’s), I proceeded to load up the boat. In a precursor to the next day’s hike, I was assaulted by swarms of black flies. They made my life miserable as I tried to strap down the boat…gotta love May in the north! Narrows between North and Little North Lakes, with Ontario on the right and Minnesota on the left. The drive to North Lake is about 105km, of which only just over two-thirds is paved. The drive becomes rather bumpy after leaving Highway 588 for the final 9km into the lake directly on the old grade. After unloading the boat, we began our ride to Little North Lake. Since I was only working with a 6hp motor, it took about 40 minutes to reach our destination. This part of the railway is only accessible by boat from Canada. 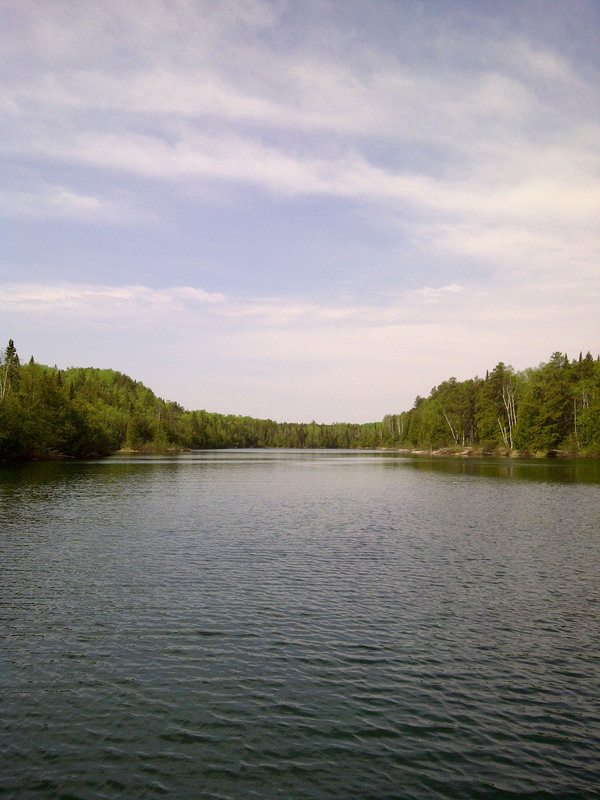 Mile 75 of the railway at North Lake was the location of a 1000 foot trestle that burned in 1909. The bay was originally called Goose Bay, but it is referred to as Trestle Bay in more recent times. I first visited the area west of Trestle Bay back in 1991-1992 (I can’t remember which year) after the rail bed was cleared all the way to the end of Gunflint by the Ontario Federation of Snowmobile Clubs. I guess the old grade made a perfect trail for them and all it needed was the removal of the forest growth. It was such a pristine area, as no one had been on that part of the railway in a very long time. Besides spending some time with the boys, my main objective for this hike was to locate some old telegraph poles along the grade. These poles were put up in 1903, even after the railway (owned by Canadian Northern at the time) had decided to stop running passenger trains to Gunflint Lake. The only business past North Lake was the Pigeon River Lumber Company logging camp at the east end of Gunflint. They built their own line, the Gunflint and Lake Superior, 4.5 miles from the PAD&W at Little Gunflint Lake across the border to Crab Lake to haul logs to Port Arthur. The operation lasted until the trestle burned in 1909. The only reason to put up the telegraph line this far must have been the importance of the logging business; I wanted to confirm that it had indeed been done. If memory serves me, I located the first pole back in 1995. I returned in 1997 to photograph and record this and another pole I located. They were in fairly decent shape. Last year I found a large coil of telegraph wire along North Lake near Trestle Bay and re-discovered the second pole on Little North, but unfortunately the cross beam had fallen off. I was determined to find that first pole, as well as a pile of discarded rails that had been left near the same spot. 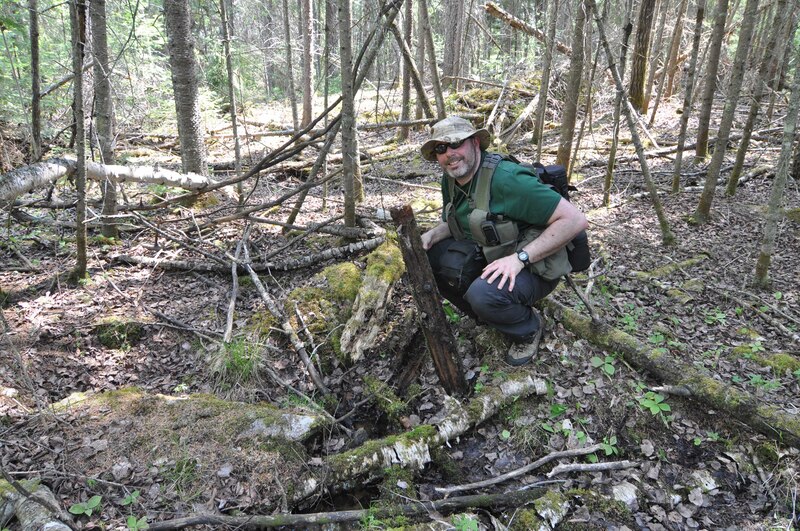 Immediately after starting the hike, my son Ethan found a pile of rails north of the grade in the bush. I`d never seen these before (if I remember correctly) since they would have been obscured by the summer growth. Another short distance ahead I located a small pile of coal that had been dropped by a passing train sometime before 1909. 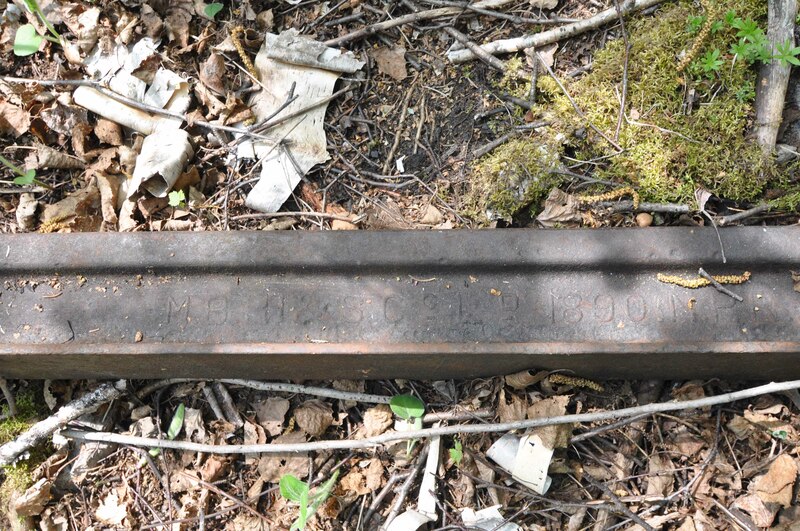 Then five minutes later I found the rails I was looking for, but no pole (the rails are stamped M.B.H.I & S Co. 1890). The pole had obviously disintegrated in the last 12 years. second rails to take one last look for the pole. When I got there, I just happened to glance up from where the rails were lying and noticed something green in the background. 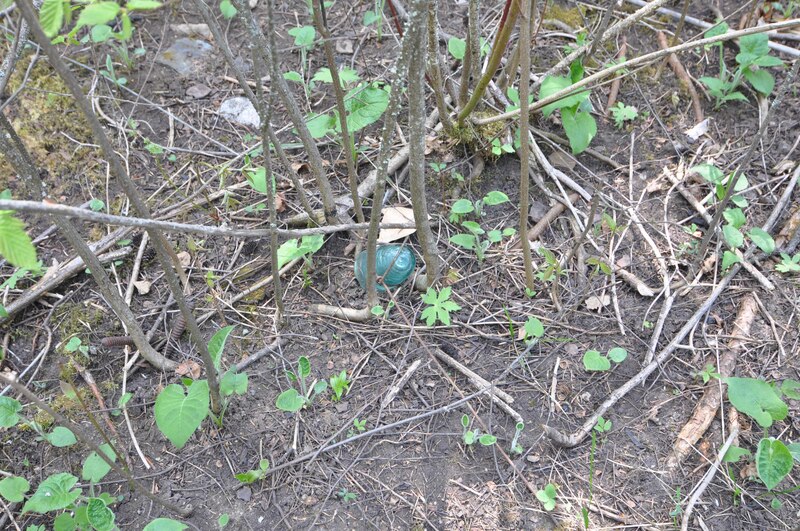 My first thought was “no way!” Making my way over, my assumption was correct; I had found a glass insulator from a telegraph pole! In all my years of hiking I had only seen maybe a dozen poles and only found 3 insulators. The wire was still attached and examining closely I could see remains of the pole. After removing the insulator, I tried following the wire in both directions but came up empty. Holding telegraph pole cross beam, Little North Lake. Our second stop was a short 900m boat ride west to a second telegraph site. I saw it on two occasions last year, but I just wanted to take a quick poke around to see if I could find anything else. Unfortunately there was nothing else to see, but I did get some good pictures! 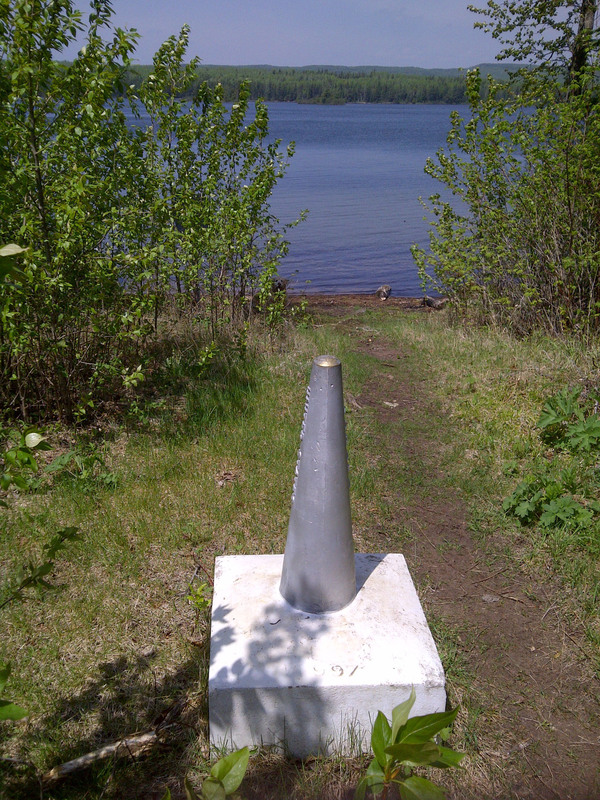 From Little North, we headed back 5km to North Lake and a visit to the Height of Land Portage. This strip of land separates North and South Lakes, as well-being the border and the Laurentian Divide (water from North flows into Hudson Bay and South flows to Lake Superior). I’ve been there many times, and there’s something to be said about wandering back and forth across the Canada-US border. In case you’re wondering, the Webster–Ashburton Treaty that finalized the imaginary delineation allows people to cross the border on the portages. So I even visited another country this weekend…all in a day’s work! Boundary Monument. US on left, Canada on right.